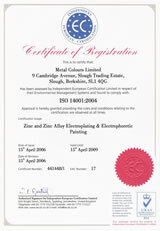 Technical Services: Metal Colours Ltd operate a technical centre whose task it is to ensure high quality standards across all finishing operations. The technical centre is equipped with a range of analytical tools and reference material with which to monitor operating processes, optimise chemical process routines and liaise with customers regarding the most suitable finish for their components. Expertise: The Technical Centre is directed by an experienced professional chemist whose principal responsibility in conjunction with the Quality Manager, is the maintenance of the highest standard of quality for all clients' work. 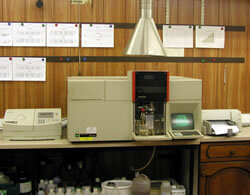 Technology: The Centre operates state of the art analytical technology, including x-ray fluorescence equipment for the determination of plated metal thickness and zinc alloy analysis, an atomic absorption spectrophotometer, and a potentiostat. 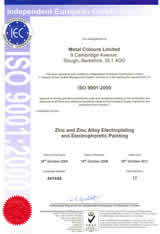 The Centre is also responsible for the optimum process control of the plating, electrophoretic paint and powder coating plants and carries out non-destructive testing on behalf of clients. Salt Spray Testing: The Centre operates a full salt spray testing cabinet and carries out testing on behalf of clients in accordance with ASTM B117 for runs of up to 2000 hours.